November 2012: Tips, eNews & More! This past weekend I was walking through a mall and, believe it or not, I heard my first holiday song of the season. While winter does not officially start until next month, the holiday season seems to come earlier each year. I must admit, the cheeriness in the song did lighten the mood of the day. It also reminded me that it's time to finish the fall chores around the house and bring the warmer wardrobe out of storage (this year I'm not waiting until the last minute to search for a hat and pair of gloves). Did you know that there is a connection between diabetes and gum disease? Patients with diabetes have a higher risk of developing periodontal disease. This risk increases if the diabetes is poorly managed. A combination of high levels of glucose in the saliva and weakened bones and gums (caused by affected blood vessels) compounds the likelihood of infections. If you or someone you know has diabetes, we encourage you to speak to us about routinely monitoring your oral health. We hope that you have adapted to the time change, and the shorter amount of sunlight in the evenings that comes with it. 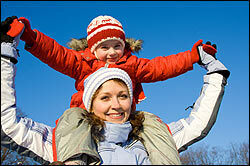 It's a good time to add vitamin D to your regimen. It is also a great time to remember to check your smoke detector batteries and expiry dates. This year we would like to add your carbon monoxide detectors to this list as well. Many CO2 detectors plug into your electrical sockets, but remember, they have an expiry date. Replace any expired detectors around your home and protect your family, especially if you have a gas furnace (which has likely been running for weeks now). Have a safe and healthy month. REMINDER: November 16th is a PA Day. We are open for business, come in for a check up. Has Dr. Nick done a great job getting the best out of your smile? Would you recommend Dr. Nick to your friends and family? If so, Lawrence West Dental is always accepting new patients! The referral of your friends and family is the greatest compliment you can give Dr. Nick! The winner of our pumpkin carving contest is Eugen Vitiziu - who has won a Professional Whitening Kit! Thank you to all the participants who participated in our contest! We are proud to announce that Lawrence West Dental was successful in its fundraising efforts in the "Dress for the Cause Campaign" for the Breast Cancer Society. We raised $1000.00. Thank you for all the generous donations! All your generous donations will go a long way in creating a future without Breast Cancer. "Is it time to to change my tooth brush?" If the ends are starting to fray or the bristles are starting to lose their shape, its time for a new brush. Click here for more recommendations!! Do you think the City of Toronto will eliminate the Municipal Land Transfer Tax in Toronto? Toronto Budget Chair Michael Del Grande is backing away from plans to chip away at the city's land transfer tax, saying the city's finances are too tight to reduce the levy. After months of going line-by-line through the city's books, the Scarborough councillor, an accountant, says the city can't afford to reduce a source of revenue expected to bring in $330-million this year. The problem is not the coming year, but the budget crunch coming in 2014 due to several factors that will take in effect in 2014 resulting in a loss of about $70 million from the city's operating budget. Mr. Del Grande, said no one wants to raise taxes in an election year, but described the city's fiscal situation as "unsustainable." The Mayor of Toronto on the other hand has vowed to hold residential tax increases at 1.75 per cent for 2013 and flat-line them the following year. He also has said he would like to eliminate what he describes as a "terrible" land transfer tax. With the colder days upon us, heavier, heartier foods that warm you from the inside seem appropriate for our recipe section. 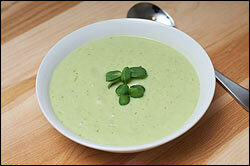 Peas seem to be in abundance at the local supermarket and make for a wonderful soup. The option of green or yellow peas will let you decide on the colour of your soup (depending on your mood). While green peas have a very distinct flavour and yellow peas are a bit mellower, they both go well with fresh and dried herbs. If you can't find fresh peas when you go to try this recipe, dried split peas will work well (as an added bonus they don't need to be soaked before cooking like other legumes and beans). To help this recipe in the "hearty department", we are going to suggest thickening it up with cauliflower. That's right cauliflower can replace potato, flour or any other thickener that would typically be used in a soup. Cut up cauliflower florets make the perfect addition to any soup that you are going to blend up or puree. They add a healthy dose of fiber, antioxidants and vitamin C, rather than empty calories or simply starch.